Could FSC be one of the Best Brunch Philadelphia ? Well Uwishunu chose Front Street Cafe (FSC) as one of the top picks for “Where to Brunch in Philly this Winter.” Full article by Julian Wilson here. And Chose Front Street Cafe as one of the Best Brunch Philadelphia. It’s no secret that Philadelphia does brunch very, very well thanks to brunch-focused restaurants serving eggs and bacon all week long and fancier establishments that serve meticulously crafted brunch only on the weekends. During the winter, brunch takes a majorly cozy turn with soul-nurturing egg hashes topped with braised meat, stacked burgers, wood-fired meals and overflowing biscuit sandwiches. A number of Philly restaurants even up the ante with fireplaces, close-knit seating, open stoves and flickering candles to keep the warmth in for brunchers all around. 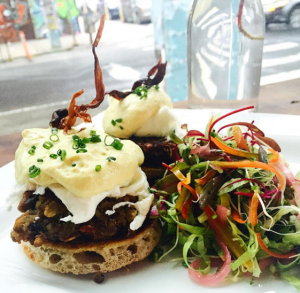 Make plans to check out Philly’s great brunch scene this winter. Those looking for healthy alternatives during brunch should look to Front Street Cafe, a farm-to-table restaurant with everything from warming coffee and fresh juices to the FSC vegan eggs Benedict and quinoa oatmeal porridge. Eggs Bennie with Vegan Mushroom Bacon Yum!